the Digital me: Server Not Found, Fix DNS Problems. Server Not Found, Fix DNS Problems. Or you cannot get www.somesite.com but your friend can! When we browser and enter a url in the browser's address bar, one of the first step is to resolve the domain name. ie convert the www.server-name.com to the IP address. There are some ways to resolve this. Get the correcet DNS IP address from the ISP, and get more than one. Install a local caching dns server that caches servernames and ip address so that subsequent visits can be made faster since resolving is done locally. 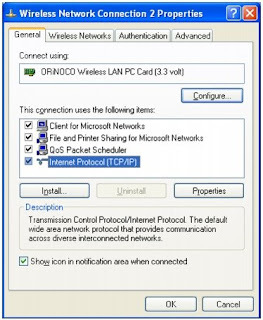 Click TCP/IP and then click Properties. Add Primary and Secondary DNS Servers. And I think a similar procedure could work with any ISP.